This season, every NBA team is bringing back "City Edition" uniforms and before Friday, we were still waiting for some of them to drop. 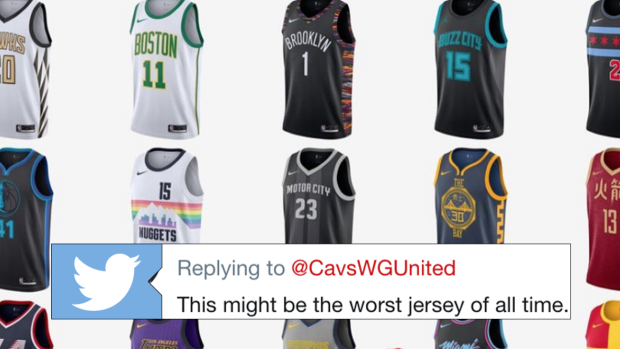 The good news for basketball fans is the wait for the rest of the jerseys is over as this picture of every single "City Edition" uniform made the rounds on the internet. Some teams made some big changes, while others didn't mess with what worked in the past and in the end, it made for some great reactions. Them look like some jerseys that a team would get after they're star leaves. The @MiamiHEAT killed this. Not even close. A bunch of teams absolutely nailed these. Denver, Chicago and Miami especially. Dallas always the ugliest design, who make those ? This might be the worst jersey of all time. Not just in basketball!